Askewed Views: Help! Help! I'm being repressed! 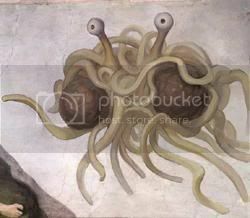 Please please do not anger the Flying Spaghetti Monster.. I don't want to be on the business end of his wrath. You know what is a good game though? Get Spaghetti in a restaurant and lob a piece at the wall...just to check. The staff loves that. LOL Oh god...don't tell me...you do that too??? ;) I wonder what his "wrath" would be....try and shove you in a Pasta jar??? Cover you with sauce???? Stick meatballs in your ears??? Hmmm..puzzling....or a bad HS food fight.